Asian food can sometimes be a little intimidating to cook at home. But the truth is, most of the dishes you order at your local Korean, Chinese, or Japanese restaurant can be easily recreated at home using everyday ingredients and a little creativity. I started my blog almost a year ago, and oddly enough, I’ve never posted an Asian food recipe. Since I’m Asian, my boyfriend’s mom is under the endearing impression that I grew up on a strict diet of sushi and dim sum–thus making me a bona fide Asian food expert. While this isn’t actually true, I do in fact love experimenting with a variety of Asian dishes at home, including Bibimbap. Bibimbap is one of my all time favorite dishes to order at Korean restaurants. It’s a mixture of seasoned vegetables and meat over a bowl of rice. It’s usually topped with a fried egg, and then mixed up and eaten with some Korean red pepper paste called gochuchang. At first glance, this dish seems very complicated to make. But once you get the basic flavors down, it’s a very healthy and simple way to get rid of leftover veggies in your fridge. My variation of bibimbap may not be completely traditional, but I’d say it’s pretty darn good. 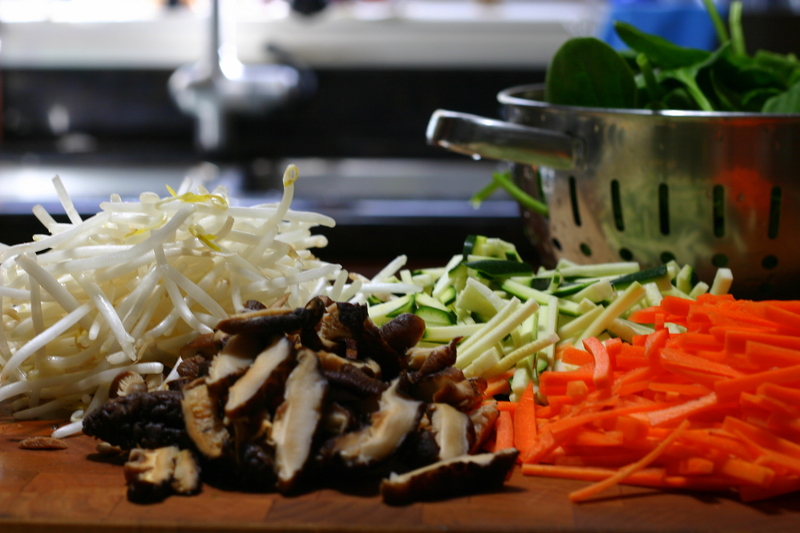 The trick to making bibimbap without going insane is staying organized. Make sure all of your vegetables are cleaned and chopped before you get started, and use one large plate or platter to put all the cooked vegetables and meat when they are done. Also make sure that your other basic ingredients are within reach at all times–including soy sauce, sesame oil, salt, pepper, and sugar. 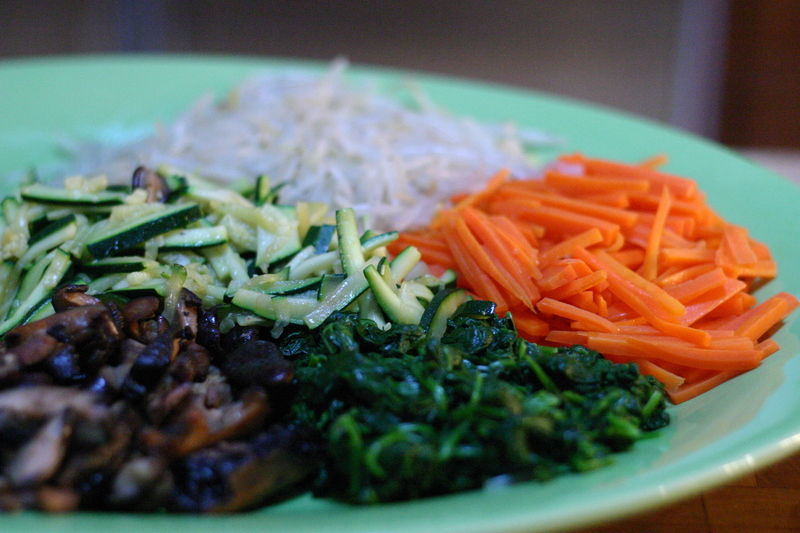 The great thing about bibimbap is that you can really use any type of vegetable that’s available. Carrots, shiitake mushrooms, bean sprouts, and spinach are generally the norm, but you can also include lettuce, cucumbers, seasonal summer squash, or even cabbage into the mix. To get the nice julienned slices, I highly recommend using a mandolin to save time. As you cook the vegetables, taste them as you go. The balance of flavors is really a preference thing, so I was intentionally a little vague about the measurements. Start out with a “splash” (teaspoon or so) of sesame oil where noted, but feel free to increase that amount if you want. Do the same with the soy sauce, salt, pepper, and sugar. I chose to use bulgogi in this recipe simply because it’s delicious. You can really use any type of meat or tofu–or, you can just stick with just the vegetables. 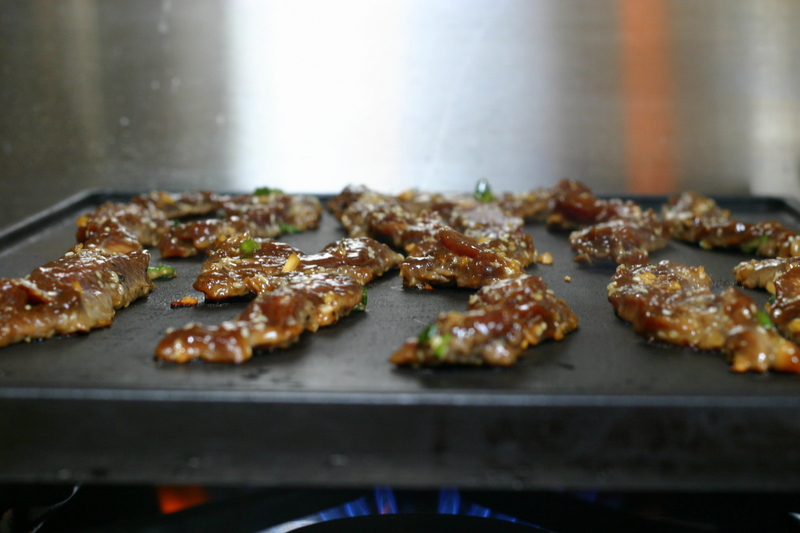 If you do make the bulgogi, ask your butcher to thinly slice the meat for you, or put the meat in the freezer for 30 minutes before slicing to make the job much easier. Some people argue that the crispy rice in bibimbap is the best part. You can run out and buy a traditional Korean stone pot, but I think you can achieve a somewhat similar result by using a heavy frying pan or skillet. (Don’t use nonstick, since the nonstick coating likely isn’t safe for such high temps) Turn the heat up to high and lightly coat the bottom of the pan with vegetable or canola oil. (Sesame oil has a lower smoke point and will likely set off your fire alarm…I may or may not know this from personal experience) Spread the rice onto the pan and press down gently using a spatula. 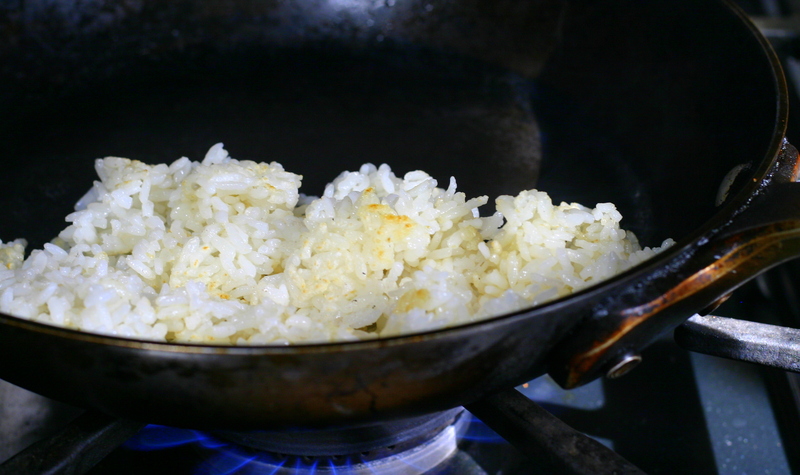 Let the rice cook, undisturbed, until you reach your desired crispiness. Break the rice up with the spatula and distribute into bowls. Bibimbap can be eaten cold or hot. I personally like the veggies cold, so I prepare them ahead of time and keep them in the fridge. When dinnertime rolls around, all I have to worry about is the meat and the rice. Prepare the bulgogi: Place the meat in a large zip lock bag. In a bowl, combine soy sauce, sugar, scallion, garlic, sesame seeds, ground pepper, and sesame oil. Pour mixture over the meat, seal the bag, and massage the marinade into the meat to ensure every piece is covered. Place in refrigerator and marinate for at least 4 hours, preferably overnight. Cook the veggies: Place zucchini in a bowl and mix with a pinch of salt. Set aside. The salt will force all the excess water out of the zucchini so it doesn’t get mushy when cooked. Spinach: Bring a large pot of water to boil. Place the spinach in the water and blanch for 1 minute, or just until it is wilted. 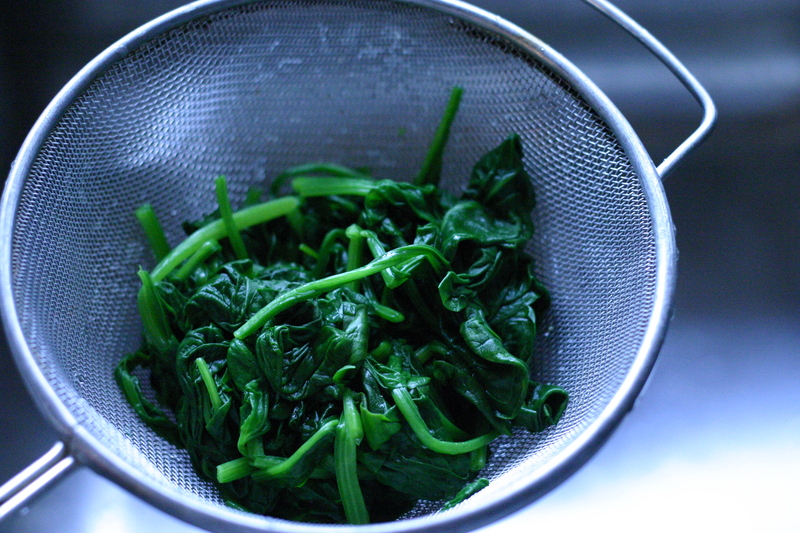 Using a spider or small strainer, scoop the spinach out of the water and run under cold water to stop the cooking. Squeeze out all of the excess water and season with a splash of sesame oil, 1 teaspoon soy sauce and salt to taste. Mix and add to the platter. Bean sprouts: Using the same pot of boiling water, cook the beansprouts until they are pliable, about 3-5 minutes. Drain the beansprouts well, and season with a splash of sesame oil, salt and pepper to taste, and a splash of rice vinegar if desired. Mix and add to the platter. Carrots: Heat a splash of sesame oil in a frying pan over medium heat. Add the carrots and cook for 1-2 minutes until they are tender. Season with salt and add to the platter. Mushrooms: Again, heat a splash of sesame oil to the frying pan and add shiitake mushrooms. Add 2 teaspoons of soy sauce and 2 teaspoons of sugar. Cook for 1-2 minutes until all of the moisture is absorbed by the mushrooms and add to the platter. Zucchini: Drain the excess water that has accumulated in the bowl. 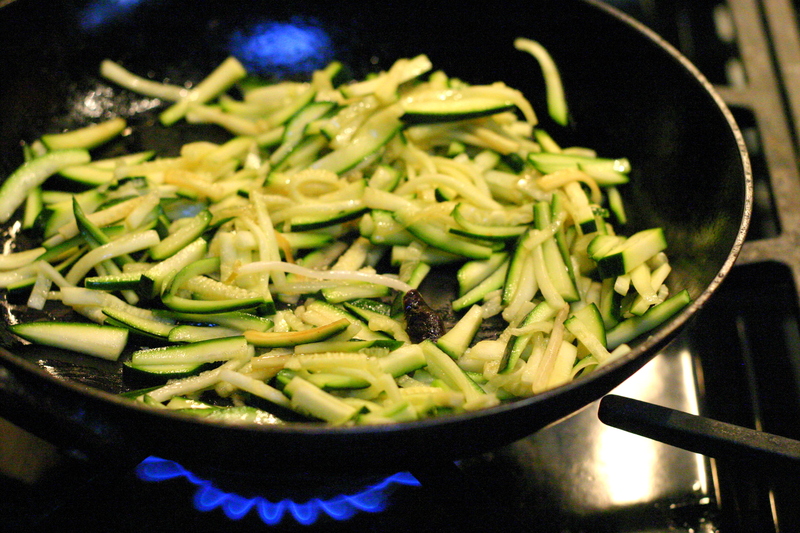 Again, heat a splash of sesame oil in the frying pan and add the zucchini. Cook for 1-2 minutes until it is tender and heated through. Add to the platter. Cook the bugolgi: Turn an outdoor grill or indoor griddle on high heat and lightly oil the grill with canola or vegetable oil. Cook the meat until slightly charred and cooked through, 1 to 2 minutes per side. 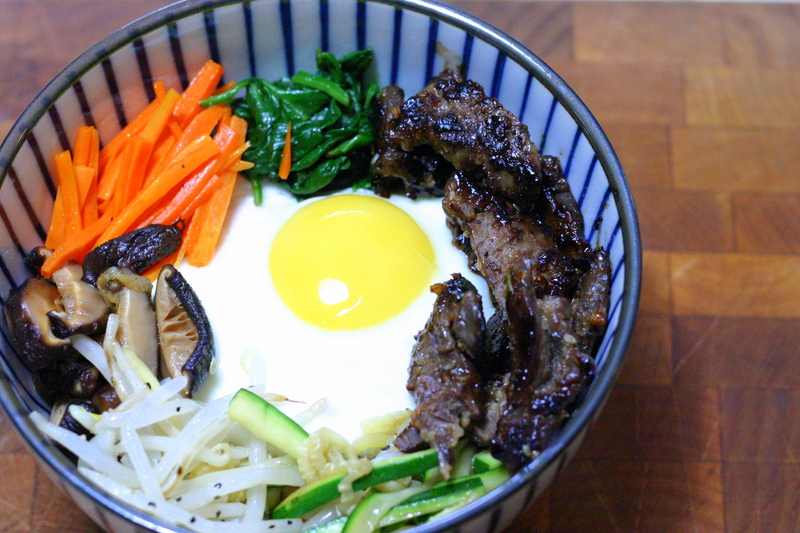 Assemble the bibimbap: Distribute rice into individual bowls. Top with the vegetables and meat. Add one sunny side up egg per bowl. Serve with gochuchang, and additional soy sauce and sesame oil, if desired. Mix and enjoy.